First of all, there's no reason to be alarmed by the word "radiation" in the name. That word might make it sound a bit scary, but infrared therapy has nothing to do with the radiation treatments that so many cancer patients receive. And infrared radiation isn't related to the atomic radiation that's produced by a nuclear bomb, either. It's also not the same kind of radiation (ultraviolet) that can sunburn and damage your skin, potentially leading to skin cancer. Okay, now you know what infrared radiation "isn't." But you're still probably wondering just what it is. Well, infrared radiation is actually part of the spectrum of electromagnetic energy that is emitted continuously by the sun. In other words, infrared is one of the types of radiation included in solar energy. The spectrum consists of bands of energy ranging from short wavelength, high frequency ultraviolet light through visible light down to long wavelength infrared light. The longest wavelength of light visible to the human eye is perceived as red, but infrared light (which is invisible to the naked eye) has even longer wavelengths and lower frequencies than red. In fact, the Latin word "infra" means "below," and infrared is the band of solar energy that is "below red" in the electromagnetic spectrum. In contrast, ultraviolet light has a much shorter wavelength and exists in the higher frequency ranges that the human eye is also unable to detect, above violet in the spectrum of solar energy. 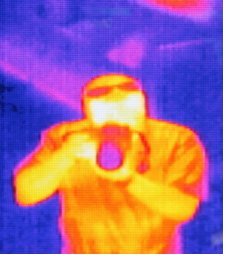 Infrared light can't be seen by the human naked eye, but we do perceive it as heat. In addition, various instruments, including infrared/night vision cameras and goggles, are able to "translate" infrared light into visible colors. Despite low light levels, people become visible through night vision goggles because humans radiate infrared energy (in the form of heat) with wavelengths of 3 to 50 microns out through the skin, although most of this radiant energy has a wavelength of about 9.4 microns. As is so strongly implied by its name, infrared radiation therapy uses radiant infrared energy to deliver its effects. Much of the information you'll read about infrared saunas and infrared radiation therapy is probably provided by infrared sauna manufacturers and vendors. These proponents of infrared technology will tell you that infrared radiation therapy allows an individual's body to absorb beneficial infrared radiant heat. In some ways you could look at infrared radiation therapy as a way to receive many of the benefits of natural sunlight without risking exposure to any of the dangerous effects associated with solar radiation, including those related to ultraviolet rays. A number of therapeutic benefits have been linked to infrared radiation, and some of them can be quite significant. One of its most well-known, popular benefits involves the ability of infrared energy to burn calories and "melt off" fat. But infrared heat therapy is also known for its ability to remove toxins and other contaminants from the body. It accomplishes both these beneficial effects by heating the body and creating a healthy, purifying sweat. And, Dr. Mehmet Oz, made famous by his regular appearances on The Oprah Winfrey Show, has explained that in addition to facilitating weight loss and detoxification, infrared heat therapy may also help lower the blood pressure. Although in many cases there is no hard scientific evidence supporting the ability of infrared radiation therapy to provide these benefits, I've talked with several people who have tried it, and they report improvements in certain medical conditions. At least for now, though, I'm looking at the infrared sauna as a place that provides a warm, relaxing oasis from the hectic pace of work and life's daily stresses. If nothing else, an infrared sauna is a great place to relax. To the page about infrared radiation therapy.